The Mayo Clinic Proceedings journal just reported (Jan 2017) on a meta-analyses of both randomized controlled trials (RCTs) and prospective cohort studies estimate the effect of EPA+DHA on coronary heart disease (CHD), prevalence and risk. The authors analyzed data from 93,000 subjects (from the 18 RCT’S) and 732,000 subjects (from the cohort studies). They examined outcomes for myocardial infarction, sudden cardiac death and coronary death. The “Omega 3 Index”, mentioned in Omega 3 and Women study, was used to measure Omega 3 status. Among RCTs, there was a significant reduction in CHD risk with EPA+DHA consumption. Subgroup analyses of data from RCTs indicated a statistically significant CHD risk reduction with EPA+DHA provision among higher-risk populations, including participants with elevated triglyceride levels and elevated LDL cholesterol. Meta-analysis of data from prospective cohort studies resulted in a statistically significant Relative Risk reduction for higher intakes of EPA+DHA and risk of any CHD event. Higher intakes of Omega 3 (EPA / DHA in particular) are showing significant benefits to reducing risk of Heart Disease. We apparently need the animal versions (EPA and DHA) as opposed to the vegetable version (ALA – Alpha Linolenic Acid). Using the Omega 3 Index it is clear that few people eat enough fish to get enough Omega 3 from their diet. Responsible supplementation becomes a necessity. 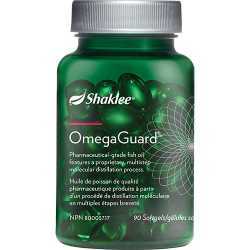 OmegaGuard - Omega-3 fatty acids.